Calling all cookie monsters: Insomnia Cookies, the shop behind those super-addictive, gooey late-night eats infiltrating college towns everywhere, will be showering us with free cookies on Monday, October 24th. Yes, that means you can use that extra cooking cash on a new black-light Pink Floyd poster for the dorm. Or just buy more cookies. 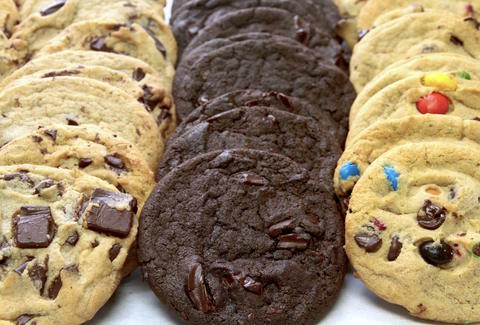 Insomnia's throwing this epic cookie party in honor of its 100th store opening, and to celebrate the auspicious occasion, every location's giving out free traditional cookies with any purchase. The company started in a UPenn dorm room back in 2003 and can now be found in 29 states. In addition to the cookie madness, Insomnia will also be giving away prizes to cookie heads using the hashtag #ICelebrate100 on their social media platforms. You're going to want to clear your schedule -- a case of the Mondays never tasted so sweet. Meredith Heil is a staff writer for Thrillist. Her milks was chocolate, the cookies, butter crunch, 88 Oshkosh and blue and white Dunks. Give a @mereditto a cookie.